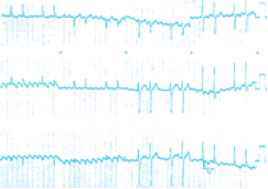 Atrial flutter, which is another example of an entry tachycardia not involving the atrioventricular node, produces an extremely rapid atrial rate as the re-entry circuit involves the atrial walls. Underlying heart disease such as coronary artery or valvular disease, primary myocardial disease, or pericarditis almost always exists. This arrhythmia may also be associated with thyrotoxicosis, chronic obstructive pulmonary disease, pulmonary embolus, and alcohol consumption. Atrial rates are usually between 250 and 350 beats/min; in the absence of atrioventricular node disease there is usually a 2:1 block with a ventricular response of approximately 150 beats/min. 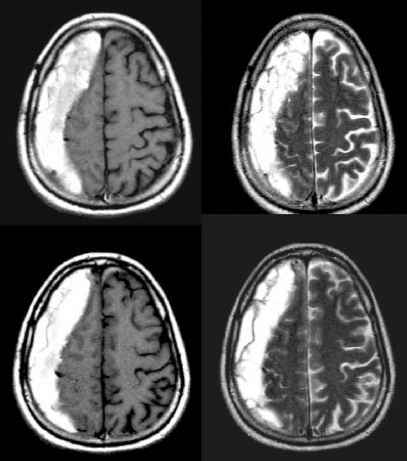 As with atrial fibrillation, patients with Wolff-Parkinson-White syndrome may conduct down the accessory bypass tract and have a much faster rate which could degenerate into ventricular fibrillation. Conduction through the accessory bypass tract produces a wide complex tachycardia that may be difficult to distinguish from ventricular tachycardia. The ECG typically shows sawtooth flutter waves best seen in leads II or V1 (Fig 6). Carotid sinus massage may increase the atrioventricular block transiently to make the flutter waves more obvious. Fig. 6 Atrial flutter. Notice the sawtooth flutter waves best seen in the inferior leads.